Averatec is a brand new company in the UK, but it has been operating in the United States since 2002. Averatec's parent company is Tri-Gem, currently the third largest manufacturer of computer hardware in the world. With such a pedigree behind the company, we are expecting great things from this brand. The Averatec 6240 (£799 inc. VAT) has a 15.4-inch TFT panel sports a native resolution of 1280 x 800 pixels. The screen of our test unit was crisp and clear with no signs of dead or blown pixels. The use of integrated graphics helps keep the cost to a minimum. However, the use of a SiS 760 chipset is less than impressive, as it offers minimal performance. This was borne out under test by a 3DMark 2003 score of 161. Such a result represents minimal performance and, as it does not support DirectX 9, it cannot be used for playing many modern games. While Linux-based partitions that allow for the playing of DVDs as well as accessing your music and images, are commonplace, the 6240 offers DVD support without the need to access the hard disk. In this way, battery power can be conserved. Function buttons on the front of the chassis control the player. DVD image quality isn't as high as you'll find on a TV, but it's more than satisfactory for occasional use. A remote control is also supplied, stored in the PC Card slot, for use with the DVD player. On the downside, if you need to switch over to using the laptop itself, you'll need to switch off the DVD player and boot up the operating system. Averatec has opted for an AMD processor in the 6240. 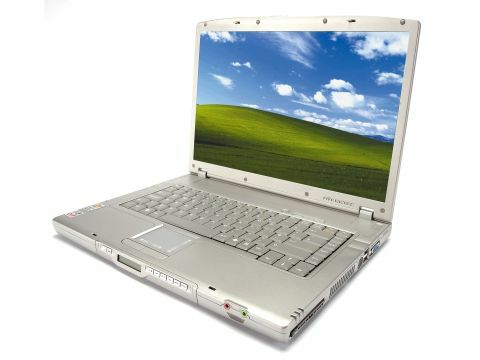 In this instance, the system is powered by the AMD Athlon 64 2700, which has a running speed of 1.6GHz. Supported by 512MB DDR SDRAM and a 60GB hard drive, the basic configuration of this system is more than in keeping with the price point. When it came to benchmarking the 6240, a MobileMark 2002 score of 161 was recorded. In daily use, we found the 6240 to be a powerful and responsive system, with little or no delay in running standard office applications. With a battery life, under test, of 170 minutes, the unit falls just short of our three hour usability limit but, in such a form factor, the 6240 weighs 2.8kg - mobility is a reasonable option. The keyboard is fitted in the centre of the main board. The keys are individually mounted, but were not that responsive, with the occasional keystroke not registering.The touchpad is small, as are the mouse buttons, but we found them to be sturdy and responsive.